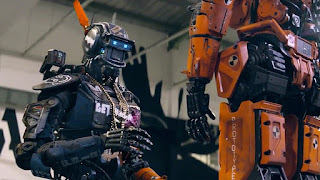 Continuing with my series of blogs about life, consciousness and being, today I want to write about issues raised in the 2015 science fiction film, Chappie. Chappie is a film from earlier in the year by South African writer and director, Neill Blomkamp, who also made District 9 and Elysium earlier in his career. Chappie is a film about a weapons company, Tetravaal, and specifically a young programmer there called Deon who is trying to create robot AI. He has already created police robots with a limited AI called scouts but he wants to go further than this and create one in which the AI would be self aware. This self aware robot turns out to be the "Chappie" of the title. Before I go further I should point out that, as with my blog on Ex Machina last week, if you don't want to know anything more about this film you should go and watch it first. Discussing the film below will require me to reveal plot points. As a film Chappie lies somewhere between past robot films Robocop and Short Circuit from the 80s. It is a little rough around the edges and the philosophy of the film is nothing like as polished or as philosophical as, say, Ex Machina. If the subject is robot consciousness then this is the mainstream version and Ex Machina is for the deep thinkers. Where Ex Machina has deep conversations about chess computers and the origin of sexuality, Chappie has some fight scenes and explosions. This is presented as a more middle of the road attempt to cover some similar ground. But readers shouldn't let that deceive them into thinking that there is not much covered here as there are still a few things to chew on. Some of these issues are ones parallel to the more cerebral Ex Machina. I'll go through them one at a time. It is stated from the outset that the robots in Chappie are the property of Tetravaal. Deon, their creator, works for them but it is Tetravaal's money and Tetravaal's insurance risk should any of the robots malfunction. This becomes a plot point later in the film as Deon uses a damaged scout to try out his completed AI program. This robot, regarded in the film as but a child after he is switched on with his new AI for the first time, falls into the hands of gangsters and is then schooled by them into criminal habits. From this point on two disparate and opposing points of view are presented. First we have the company view represented by company CEO Michelle Bradley (played by Sigourney Weaver) and another robotics expert, Vincent (played by Hugh Jackman). Vincent, in particular, has spiritual issues with robotic AI and has, instead, created a robot called "Moose" which is controlled mentally by a human being using a special helmet. For the purposes of this point, though, it is notable that both these company representatives regard robots as machines and as property. They are tools to be used, pure and simple. The opposing view is represented by Deon, the creator of the robot and the AI, and by the gangsters, Ninja, Yolandi and Amerika. Here we find the view represented that intelligent, self aware robots can be treated as, and regarded as, beings in their own right. They are things that need to be reasoned with, persuaded or shown how to do things. They are things which can learn or have a sense of personhood. It may be suggested that the criminals manipulate and cajole Chappie (rightly so) but they never seem to regard him as simply an object which belongs to them now since they stole him. An issue that follows from these opposing opinions is that of how AI and robots come to be. They are expensive things requiring extensive resources. Can we imagine a world in which mega-corporations create these beings at their expense and then just decide to regard them as independent beings and respect their freedom for nothing over the problems of insurance, red tape and paperwork? Chappie, early on in the film after he has been switched on for the first time by a Deon captured by the gangsters, is regarded as a child with barely any knowledge of the world. He is regarded, from the first though, as a being with personhood, a sense of individuality, by Deon and by the gangsters. His maker Deon tells him to do good and not bad and not to let people take him down a wrong path, something you would tell a being you thought could be responsible for itself and around others. Chappie also comes to accept Ninja and Yolandi as "Daddy" and "Mommy". On the other hand, Vincent seems to regard AI beings as not humane or moral and, crucially, as not "human beings" (whom he seems to see as more responsible). But with personhood, if Chappie be granted that, also comes rights. There is a scene where Chappie is left to fend for himself by Ninja in his "cruel to be kind" style of parenting and is consequently attacked by a gang of youths and then captured and accosted by Vincent in scenes meant to elicit some sympathy for the character. By this point we are also meant to be thinking of Chappie as a developing being with feelings and attitudes and opinions. (Chappie says as Vincent attempts to cut off his arm with an angle grinder "Chappie has fears".) So the question becomes is Chappie just a collection of software and circuitry in a metal chassis, just a more complicated laptop? (Vincent says to Chappie "This program makes you think you're real. But in here *tap tap* there's just a bunch of wires.) Is it the case that, no matter how a complex AI like Chappie appears, we should never really regard him as a person? Is Chappie a person or not and what would it mean if he was? Do such beings, whatever their physical make up or the circumstances of their creation, have rights? Does every kind of being that can think for itself and have opinions and intentions have rights? 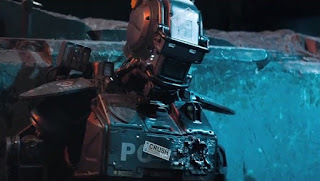 Chappie becomes acquainted with the idea of finitude (death) throughout the film when he learns that his battery is fused to his chassis and so can never be replaced when it runs out after 5 days. This, we may say, is one consequence of being a robot. Chappie's response is to find a technological way to live on and this leads us into the "big ideas" of the film regarding the nature of consciousness. (The program that Deon has created giving Chappie "life" is consciousness.dat.) It may be questioned whether the film takes bodies seriously though. On a number of occasions Chappie raises the question of body issues. Chappie has his arm cut off with an angle grinder and experiences fear. Due to his battery issue, he also needs to swap bodies completely. Human characters also "become" robots. Does this film take corporeality seriously? Does it address such issues appropriately? Aren't we also our bodies and aren't we, thus, profoundly attached to them? Isn't making consciousness "essential" but bodies not somewhat gnostic, emphasizing the incorporeal over the corporeal? This attitude is mirrored, somewhat, in the real world by those like Ray Kurzweil who want to do a similar thing with our biological circumstances. He hopes for a future where his own identifiable consciousness could be "uploaded" to a robot body. But isn't finitude, an end, a part of being alive? Shouldn't life have an end? And to what extent is our consciousness based around our very specific physical circumstances? For me this is one area where Chappie is not like a human being but a different kind of life. His physical circumstances are completely different. Brains, I think, are not simply a kind of biological circuit board. Consciousness in Chappie is, in the end, regarded as data that can potentially be saved on a USB stick or a computer hard drive. Is this right? Can it be captured or recorded or transferred? Can it be modeled as Chappie does with his own and with Yolandi's and Deon's? Is consciousness just a case of capturing what is there and hosting it somewhere else suitable? In addition, there is more than one kind of AI in evidence in this film. The scouts themselves have AI but it seems not to be at a fully conscious level. They are merely able to carry out their police activities. Chappie, however, is capable of feeling, having intentions and forming attitudes (amongst other things). Is this film then saying that consciousness appears at some tipping point along a scale of AI? Is intelligence, artificial or biological, consciousness? What is consciousness? The film itself seems somewhat confused by this admittedly large question. There is a scene in the film when Vincent, who has got wind of Chappie, deactivates all the scouts in an attempt to derail Deon's project completely. Deon takes Chappie to Tetravaal to try and fix him. There he tells Chappie that "consciousness is not data" and that we don't know what it is so you can't move it. 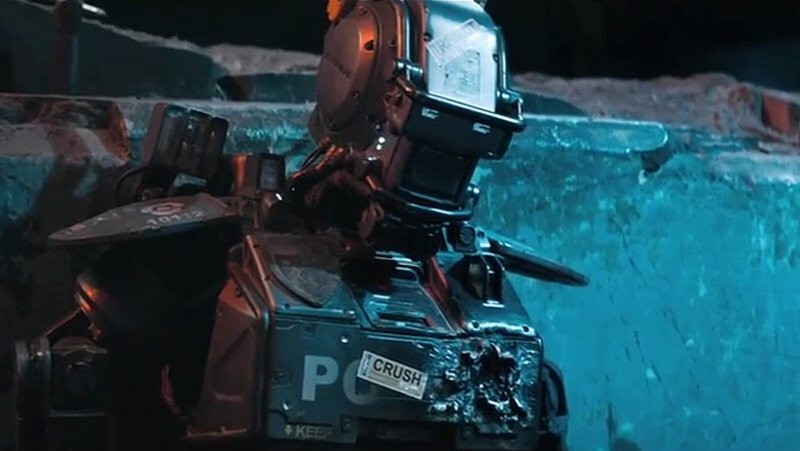 In another scene, Chappie tells Yolandi that "consciousness is like energy" as he sets about trying to modify one of the helmets Vincent has developed for controlling his own robot, "Moose". Chappie also speaks of "getting his consciousness out" as if it was "in" somewhere and says "That's me" the first time he manages to capture his consciousness in data on a laptop and has it displayed on the screen. All this is, I think, somewhat of a mess although, in the context of a rollicking action film, you don't notice it so much as you would if the plot were more cerebral. But the questions are left hanging. Just what is consciousness? It's a point the film really does need to get right because the entire plot depends upon it. In the end, I think they fudge the discussion and just make consciousness something you can have on a USB stick for plot purposes. But it goes further than this. At the end of the film (big spoiler!) it takes another leap when human consciousness, in the case of characters Deon and Yolandi (the first of whom is dying, the second of whom is dead), have their consciousness captured and transferred into robot bodies. That is, human beings become consciousness within robot bodies. For Yolandi this would be something different than for Deon in that Yolandi has died. Thus, it would seem that a "snapshot" of her consciousness is to be the basis of the robot version of her. But in the case of Deon an existing living consciousness is transferred from his still living, biological body into a robot scout "on the fly". The philosophical question this raises for me is this: is Being consciousness or mind? Is it really that simple? My concerns regarding physicality from point three above reassert themselves here. I found Chappie to be an interesting and enjoyable film. I will keep repeating that it does not set out to be at the same level of debate about robots and AI as does something like Ex Machina though. It is primarily a mainstream science fiction action film. But it does cover issues that touch on the rights of the individual, morality, what being alive means and what makes something a living being worthy of respect. As such, it deserves to be thought about and pondered over. The most interesting thing for me is what happens next now that not only Chappie is a robot but his maker Deon and his "mommy" Yolandi are too! If You Were A Simulation Would It Really Matter?